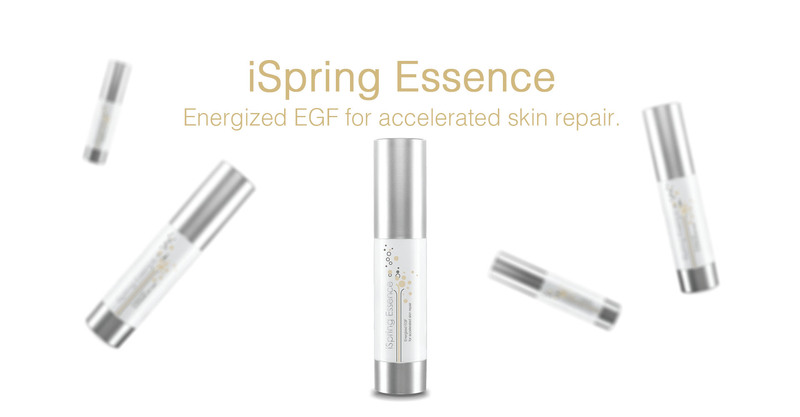 iSpring Essence is made of a unique formulation that rapidly rejuvenates skin by combining the Nobel Prize winning discovery of EGF (Epidermal Growth Factor) and Euphoria TechnologyTM with an organic herbal skincare blend from Australia. iSpring Essence enhances the rate of natural skin regeneration and is suitable for all ages and skin types. The discovery of EGF has been a revolutionary scientific achievement that slows aging. EGF is a naturally occurring substance in the body and is highly active in keeping the skin youthful. After the age of 30, EGF rapidly decreases and loses its potency which leads to the appearance of ageing. Replenishing EGF is the natural way to revitalize ageing skin. iSpring Essence penetrates deep into dermis to nourish the skin, accelerates turnover of skin cells and metabolism, so the damaged skin will be repaired faster. It is proven to revitalize aging skin, increase skin elasticity; and reduce wrinkles and fine lines. You will have a softer, smoother, more luminous and youthful complexion. iSpring Essence is suitable for all ages and skin types. It is free from preservatives, mineral oils, fragrances, parabens, synthetic chemicals and any other harmful substances. iSpring Essence is enabled by Pico Technology.